The book begins with a choice: do you want chocolate or vanilla ice cream? The decision you make determines the book's possible outcome: doom or happiness. By following the different paths connecting each panel, you can move forward or back, up or down, or onto other pages, creating your own adventure. I've read the book 6 times so far, and it's always ended in destruction, but who knows? The outcome may be different next time. Meanwhile is definitely a book to get lost in! This is my final post of 2010. Look for new entries in January 2011. Animals large and small are hiding in this 15½" x 11" book. 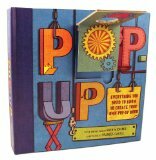 Young children will enjoy lifting the flaps to discover interesting tidbits about each animal, while older children will want to emulate the book's simple, stylish design. A minor, yet frustrating, quibble: the authors ask readers "Can you name all eight species of bears?" but do not provide the answer! Nor do they tell us what prehensile means. Also, prehensile is an adjective used to describe an animal's tail, which is able to grasp or hold something. This hands-on book introduces you to the basic folds needed to create 3-D images and moveable devices. Tear-out instructions and press-out pieces are provided so you can complete a dragon, a castle, Frankenstein's laboratory, and a jungle scene. Each project increases in complexity, from simple angled folds to spirals and noisemakers. The instructions are fairly easy to follow, even for someone like me who never got the hang of paper airplane folding. I accidentally crumpled the castle's flag, and couldn't manage the knot on the elastic band (I had to find a longer elastic), but everything stands up! On a cold December night, the old men of the mountains (los abuelos) come down to the village to ensure that all the children have been good. After the abuelos chase the children around the bonfire, they join the families in the fiesta. A warm, colourful introduction to a New Mexican solstice celebration. An idiom, as defined at the beginning of this wonderfully creative book, is an expression that can't be translated literally. Wallace Edwards uses his fantastic animal portraits to illustrate 26 common idioms. A lion getting his mane blasted while facing the music, a camel actually cooling her heels while waiting for a train, and a bored cow on a surfboard going with the flow are some of the clever ways of uncovering the idioms' meanings. To ensure readers get the hang of it, the idioms are explained in detail at the back of the book. To add to the fun, a cat is hidden in every painting. So jump in and give this book a whirl. You'll find that idioms are a piece of cake! Another spectacular feat of paper engineering by the incomparable Robert Sabuda. Of note are the pull-up accordian booklets that let you inside the depths of the Beast's castle, the dark, terrifying beast himself, and his transformation. The text isn't quite up to par, but that's to be expected when overshadowed by 9-inch tall sculptures. A terrific gift for kids of all ages. Ethan hadn't wanted to attend summer camp, but camp turns out to be better than expected. He's not the worst at anything, and he's not hated either. Then a new boy is assigned to his cabin. Zach is rumoured to be a bad boy, expelled from one camp after another. Ethan isn't sure if the rumours are true or not, but he's fascinated by him. Zach is different: he despises nicknames, listens to Buddy Holly, and refuses to participate in camp activities, except for the Big Swim. When he's barred from the event, which involves swimming to the island and back, he turns to Ethan for help. The Big Swim is a short, yet intriguing book. Many things are left unsaid: Zach's family background, his previous camp experiences, Amber's letter to Ethan. But it's a book that makes you think. A good book for ages 8- 12. Soccer is truly an international game; a shared passion played all over the world. A Beautiful Game celebrates this popular sport through the stories of some of the world's most well-known players - David Beckham, Lionel Messi, Gilberto Silva, Claudio Suárez, and others (42 in all). What these men all share is an abiding love for soccer, played as often as possible: on streets, dirt, grass, gravel or any available surface. In fact, their stories are so similar that some of them are less than compelling. However, the wonderful photographs scattered throughout the book more than make up for it. The Ivory-billed Woodpecker was a large black-and-white bird that used to roam the American south and parts of Cuba. It instilled awe in anyone who saw it; their cry of Lord God, What a bird! gave the bird its nickname. Hoose's amazing book spans 200 years of history, introducing hunters, bird collectors, artists, and lumber companies. The first chapters are disturbing and saddening as whole families of birds are killed for prestige, fashion, and scientific study. It is especially tragic knowing that early ornithologists, although great contributors to our knowledge of birds, were often responsible for a species' demise, as were the many museums clamoring for specimens. Conservation was not on anyone's agenda; in fact, demand for a bird increased the closer it was to extinction! Thank goodness today's ornithologists would rather study live birds than dead ones. The best chapters take readers deep into a Louisiana swamp, where James Tanner, a young ornithology student, struggles to find the last remaining ivory-bill and save its ever shrinking habitat. He was only partially successful. Over the years, there have been sightings, although none officially documented. The search is still on for the Lord God bird; perhaps one day, it will return. Until then, we can only hope. When Lucy the Bear finds a cute critter in the forest, she takes him home with her. She's convinced that Squeaker will make the best pet ever. She soon finds out that little boys are impossible to train. The author makes good use of word balloons to tell his story, and his hilarious illustrations are very appealing. Where else could you find a bear in a tutu? I also liked Lucy's kangaroo outfit! Read an interview with Peter Brown on Seven Impossible Things Before Breakfast. 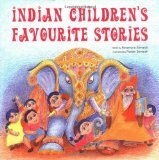 A charming collection of Indian folk tales that provide insights into India's culture and history. The stories include that of Munna, who cleverly tricks the Raja into giving away his entire granary of rice; Raman, a mischievous village boy who becomes a king's jester; and foolish Guruswami, who sets out to find even more foolish people than himself. Accompanied by colourful drawings, these tales will be enjoyed by ages 5-8. A collection of seven stories that explain the origins of the Deepavali festival. Within these pages, you will meet the great god Vishnu, Ravana the ten-headed rakshasa (an ogre), Hanuman the half human/half monkey warrior, and the fierce goddess Mahadevi, who liked to dance. For anyone who enjoys fairy tales, battles, and fantastical creatures. It's that time of year again, when stores try to get you to buy, buy, buy. Before you part with your money, maybe you'd like to learn about money: where it comes from, how it's made, how it grows, how to spend it, and how to earn it. Written in a lively, engaging style, this is an informative, entertaining book that would make a great gift (with cash, of course!). Mau is returning from the Boys' Island when he is caught up in a tidal wave. His village, the Nation, is gone. It is up to him to rebuild it, with the help of a shipwrecked girl. A lot of cultural misunderstandings occur, but gradually, a new Nation is created. A very thought-provoking novel, with multiple themes of loss, love, courage, religion, and politics. Interesting subplots, discoveries, and insights keep readers entertained until the very last page. Highly recommended. A very detailed and enlightening book about a misunderstood religion. It tells you everything you ever wanted to know about the history of voodoo, the gods and spirits served by voodoo devotees, and all the rituals and special rites involved in voodoo practice. It also debunks some commonly held myths about zombies and black magic. Parents need not be concerned about the subject matter. The initiation proceedings are so long and complicated that it should discourage most readers from attempting any curses. The ingredients would also be hard to find. For readers who only want to know the basics, Turlington has also written Do You Do Voodoo? The Real Religion Behind Zombies and Voodoo Dolls. This quick read explains the main concepts of voodoo, revealing it to be a serious, legitimate religion. Interestingly, Turlington uses slightly different words, spellings, and pronunciations. This is due to Haiti's oral tradition and regional variability. Disappointingly, the books do not reveal the origin of brain-eating zombies. However, it may inspire more creative Halloween costumes. An entertaining look at movie monsters and other undead creatures, like Frankenstein, mummies, zombies, and homunculi (small humans). While their stories are fictional, they were based on fact, as revealed throughout history. The chapter on body snatchers in the 17th and 18th centuries is particularly gruesome and true! Also real is Nicholas Flamel, familiar to Harry Potter fans as the maker of the Elixir of Life. While there is no actual proof that Flamel is still alive, rumours to the contrary still exist. Too bad the book has no pictures aside from the cover. Also missing are vampires and werewolves. To find out more about them, you'll have to find Cohen's other books: Real Vampires and Werewolves. When the author's kids - Joel, Kale and Lane - were bored, she suggested they make and sell wreaths for Christmas. They would start a college fund with the money they earned. And so The College Fund Wreath Company was born. With help from family and friends, Joel and his sisters were able to turn a profit. In the summer, bored once again, their mom suggested a lemonade stand. They also sold peanut butter and jam sandwiches, creating The Peanut Butter & Jelly Company. As the companies grew, the kids added distributors, wholesalers, and employees. Some of their ideas didn't work, but their companies remained viable, earning them over sixteen thousand dollars for college. Although the book is American-based (published in 1998), it is informative, fun, and encouraging. Good for any kid who's interested in business. When he sees the fortuneteller's tent, Peter Augustus Duchene knows a question he must ask: How can he find his sister? "You must follow the elephant," he is told. "She will lead you there." To say more would give away too much of the story and deprive the reader of its magic. It is a quiet story, with mysterious pictures. It asks three things of the reader: What if? and Why not? and Could it possibly be? And reminds the reader that magic is impossible, truth is forever changing, and anything can happen. Only Lemony Snicket could get away with a story like this. It begins with a despondent bird. A dog thinks that the bird can be cheered up by eating cake and keeping busy. He makes the bird paint ladders while he goes for a ride in a convertible driven by a goat. They go to a haberdashery with a scarlet door to buy a cheering-up hat for the bird. The store is owned by a baby, who sells the dog two hats that have a lot of panache. It ends with a mezzo-soprano who shows up to sing and eat more cake. But the bird remains despondent. 13 Words is a very strange story with very strange pictures. No one tries to find out why the bird is so sad, even though she's happy with her hat. Maybe she doesn't like cake or paint or perhaps she's a frustrated singer. Whatever the reason, you can't help but laugh, especially at the mezzo-soprano's song. In 1946 Nova Scotia, an usher in a movie theatre told Viola Desmond that her ticket was for a balcony seat, not a main floor seat. She had to move. Viola offered to pay for a main floor ticket, but the usher was adamant: she had to sit upstairs. Viola knew she was being targeted because she was black. She refused to move. She was arrested, held in prison, and fined. Angry at her treatment, she appealed the ruling, but lost. Still, her actions inspired people to fight against racial segregation. Told in clear, concise prose, this book illuminates a previously unknown true story about racism in Canada. The strong, expressive paintings capture Desmond's character, respectability (she was a successful businesswoman), and determination. An afterword provides more information about black immigration to Canada. There's a lot of supernatural romance novels for teens, mainly involving vampires. Angels and werewolves are supposed to be the next big craze. It's all governed by marketing: publishers are competing for the next big blockbuster, midnight launch party, etc. It doesn't always create good literature. So I didn't expect to like Shiver. I was initially thrown off by the book's font colour (blue). Mostly light blue, alternating with a darker blue, it made me think that my eyes were going bad. But the story drew me in and held me. I liked the idea of werewolves who became human only when the temperature was warm enough. I also found it interesting that they had an expiry date. Eventually they would cease to change, and remain wolves until death. This obviously makes the love between Sam and Grace all the more tragic. They spend six long years yearning for each other, only to meet during Sam's final time as a human. Not wanting to be separated, they try a risky cure that could part them forever. Hypnotic and beautifully written, I couldn't put the book down. I will definitely seek out Linger, the continuing story of Grace and Sam. It sounds like it will be just as magical as its predecessor. Shabanu is an 11-year-old girl who lives on the Cholistan Desert of Pakistan. Strong-willed and independent, she struggles in a patriarchal society where women are expected to obey their husbands and fathers. When an encounter with a powerful landowner almost ruins her sister Phulan's marriage, Shabanu is expected to marry the landowner's brother to uphold her family's honor and to prevent further retribution. A very good novel that sheds light on a nomadic Muslim family and its daily activities, from caring for camels to running a household. It also details their struggles with drought and dust storms. But it also raises questions about the rights of women and the relationship between fathers and daughters. Shabanu's father cares for her and protects her, but at the same time, he tries to suppress her spirit, even though he also admires it. When Shabanu runs away, he punishes her, stopping when she does not resist. Shabanu knows that she has no choice about her forced marriage, but will only give up a part of herself. The book does not offer any easy answers, and only hints at what will happen to Shabanu in the end. Fortunately, there's a sequel: Haveli. In spring, City Dog meets Country Frog, who is waiting for a friend. "You'll do," says Country Frog, and he teaches City Dog to play froggy games. 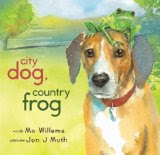 In summer, City Dog teaches Country Frog to play doggy games. In the fall, Country Frog is a little tired, so the two friends sit and remember good times. But in the winter, City Dog can't find Country Frog. When it's spring again, another friendship begins, a little differently this time. The poignant text and expressive watercolours create a lovely meditation on life, friendship, and remembrance that will affect readers of all ages. In this funny picture book, two unseen observers argue about an animal's identity. One thinks it's a duck, while the other thinks it's a rabbit. It all depends on one's point-of-view. Mimi Shapiro is on the run from a bad relationship. Her artist father offers her the use of his remote cottage, so she makes the trip up north. Upon arrival, she finds someone already living there - Jay, a young musician who turns out to be her half-brother. Jay's been spooked by a few break-ins at the cottage. Someone's been leaving strange tokens for him: a dead bird, a snake skin. Meanwhile, another young man, Cramer Lee, struggles with two jobs while caring for his unstable mother. These three lives are intimately connected. The reader realizes it before the characters do, and the suspense lies in wondering how it'll all work out. There are some creepy scenes along the way, with a slightly over-the-top ending, but this mystery thriller should keep teens glued to their seats.